MovieCaptioner is a captioning program for Mac OS X and Windows that streamlines the task of captioning video content by looping one short section of a video at a time. In addition to simplifying the captioning process, MovieCaptioner also has the ability to export captioned videos as QuickTime movies, as well as standalone caption files in a variety of formats. MovieCaptioner is available for free to all Penn State faculty and staff. Contact synchrimedia@gmail.com to inquire about obtaining a copy. Please use your PSU ID email and state whether you need the Mac or Windows version. Other users can purchase a license for MovieCaptioner – see Synchrimedia.com’s "Buy MovieCaptioner" page. MovieCaptioner is also available on all Macs in Penn State CLC Student Computing labs. It will be coming to Windows labs in the near future. If you’re unsure whether a given lab has this software, consult the Lab Locations page on the CLC Web site. MovieCaptioner is a QuickTime-based program, and requires the use of Quicktime 7 Pro or later. Like MovieCaptioner, QuickTime 7 Pro is installed on all Macs in Penn State CLC Student Computing labs. The Windows version will not require QuickTime Pro, but it is still recommended. You may need other software to convert your Windows movies to QuickTime or MPEG-4 movies to use with MovieCaptioner. 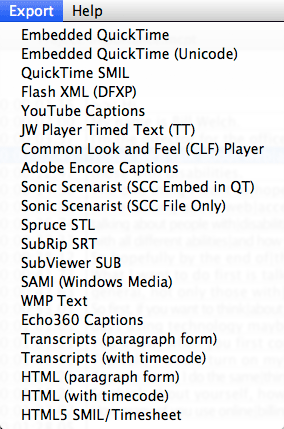 For embedding SCC format closed captions, the ClosedCaptionImporter component for QuickTime. 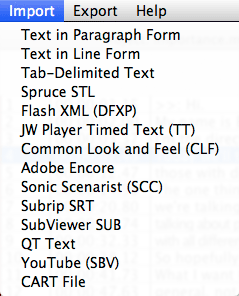 For captioning Flash videos (.swf, .flv), the Perian plugin for QuickTime. For captioning Windows Media videos (.wmv, .wma), the Flip4Mac plugin for QuickTime. These plugins are not available for Windows at this time. Open MovieCaptioner from your computer’s Applications folder. Click Load Movie in the top left corner of the screen. Find your video on your hard drive (for best results, do not use a mounted drive). Click Open. Enter a name for the MovieCaptioner project file and select a location in which to save it. Click Save. Click Start to begin adding captions. MovieCaptioner will begin looping a short segment of the video. Type your first caption in the black box underneath the video player. When you’re finished, hit the Enter key on your keyboard to record the caption and its timecode. MovieCaptioner will then move on to the next segment of the video. Note: To force a line break in your captions, type a pipe ("|") character. Note that this only inserts a line break, and does not signify the end of a caption. Note 2: To change the length of the segment that MovieCaptioner loops, change the number of seconds in the field labeled Repeat Interval. However, the default 4 second loop works well in most cases. Repeat Step #6 until the entire video has been captioned. If necessary, edit your captions in the caption list in the right-hand area of the MovieCaptioner interface. The Editing tools provide a number of useful features, such as the Insert Caption, Split Caption, Remove Caption, and Merge Captions options. When these tools are to move text between lines, MovieCaptioer is able to readjust time codes. You can also change the appearance of your captions by using the Text Properties tools underneath the video player. new captions . To change existing captions’ text properties, set the options you wish to change, then click either the Change Selected Caption(s) or the Change All Captions buttons. Enter a name for the MovieCaptioner file and select a location in which to save it. Click Save. Click on the Import menu and select one of the file types. Make changes to your captions within MovieCaptioner as needed. If you already have a transcript of your video but it has no time codes, you can import it to MovieCaptioner and assign each line a timecode to create captions. Click on Import and select Text in Paragraph Form or Text in Line Form. Find the transcript file on your hard drive or server space and click Open. If you imported Text in Paragraph Form, MovieCaptioner will import the captions, separating them by sentence. However, if a sentence is over 90 characters, it will be broken into multiple captions. If you imported Text in Line Form, each line (again, up to 90 characters) will be a caption. After you import transcripts either in paragraph form or in line form, a Set Timecode button will appear at the top of the caption list. Click the Set Time Code button to play the movie. Click the Set Timecode button again at the end of each caption line to insert a time code. Repeat the previous step until the end of the movie is reached. Once you’ve created or edited your video’s captions, you can export a caption file into a separate text file, which can then be paired with the video in a desktop or streaming video player. This option allows you to correct the text of a caption file if necessary or, in the case of YouTube, provide multiple captioning options for one video. Refer to your particular video system’s documentation to determine which file format you need. After determining what type of caption file you need, choose the appropriate file format from MovieCaptioner’s Export menu. Note: Among MovieCaptioner’s export options are .srt files (for uploading to YouTube), SCC files for iTunes, Flash XML files, and many others. .
Another method of exporting is to export a QuickTime movie with the captions embedded or "burned" in the video. This results in an "open caption" caption because captions are part of the image and cannot be hidden. This method is less flexible than exporting a separate caption text file because errors cannot be easily fixed, but is required in some services. Click on the Export menu and select Embedded QuickTime. 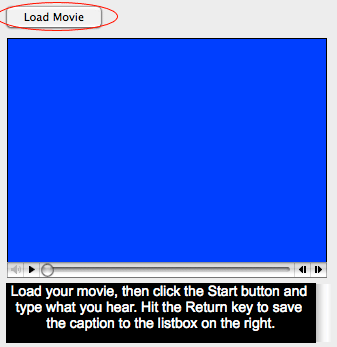 MovieCaptioner will automatically launch QuickTime, which will open a .mov file of your captioned video. Save the .mov file on your hard drive or server space. MovieCaptioner offers a template to allow users to caption recorded Adobe Connect files. See the Adobe Connect page for more information. For more information on using MovieCaptioner, and walkthroughs for utilizing some types of captions, go to Help, then How to Use MovieCaptioner. Synchrimedia also has tutorial videos, as well as a MovieCaptioner FAQ, which is helpful for troubleshooting specific issues. These resources are also linked under the Help menu in MovieCaptioner.